I often come across little secret (and some not so secret) finds, and I always say 'I would SO have that in my 'Nice Stuff Shop'. The thing with me is that I'm into so many different things and am still trying to figure out what I am MOST interested in (and good at) before immersing myself in it completely! 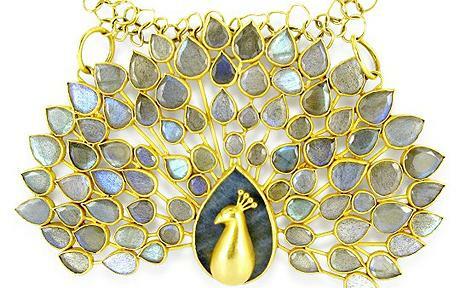 Each piece of Pippa's is unique and makes a statement on its own. 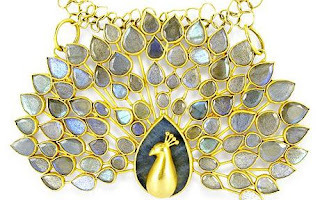 Even more amazing, is that Pippa works with various projects worldwide, helping communities such as the Kuna Indians in Panama, to rediscover their ancestors jewellery work and often ways of life. I told you she was fabulous! You just can't get better than ethical jewellery, right? Her jewellery is featuring this weekend at Paris' Fashion Week. So, if you happen to be reading this on the metro in Paris...pop along to Hotel de Crillon, 10 Place de la Concorde, 75008 to check her jewels out for yourself. I'm just gutted that we're not going to Paris until May! sigh, I shall plan better next year. I think her collection absolutely stunning, it's vibrant, it's elegant and it's fun. I would love to own a piece [ahum..Mr O]...or just have it on display in my 'Nice Stuff Shop' so that I could gaze at it all day long...that is if and when I own such a shop! Tell me this peacock necklace is not A-MAZING! These amethyst cufflinks make me wanna go out and buy a whole new work wardrobe!